Branson, Missouri has a reputation for being a Christian version of Las Vegas. The conservative tourist town is situated in the Ozark Mountains, near the Arkansas state border. Despite its remote location, the town attracts millions of visitors every year. They come for country music and Christian theater shows; for the Silver Dollar City amusement park, the Titanic Museum, and for Dolly Parton’s Dixie Stampede Dinner Attraction. I spent the night there last fall; I was there to see the soul of the USA. To understand the American heartland, you have to have seen Branson, or so I’d been told. But I had also received fair warning: you might encounter old-school racism here. Branson is a town for white people. I stayed in a hotel shaped like a giant Dutch windmill. There was a chicken restaurant right beside my hotel shaped like a huge barn; it had a giant chicken out front. I was perfectly positioned there, wedged between entertainment and bad taste. I took a stroll along the strip. There were amusement parks and diners; there was a full-scale replica of the Titanic, a giant Ferris wheel, and the God and Country Theater. I was amazed to see that the crowds on the street weren’t just white people. And then I saw the Dixie Outfitters. 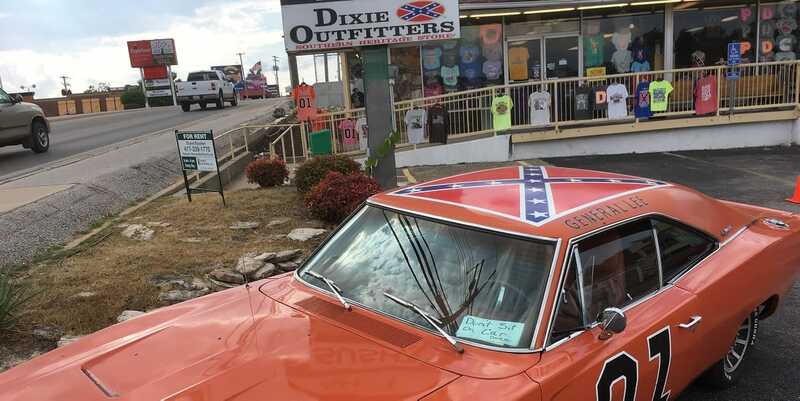 I’d been warned about this store, too: it only sells products that display the controversial Confederate flag. I entered the store, walking past racks filled with key chains, T-shirts, toy cars and bikinis. 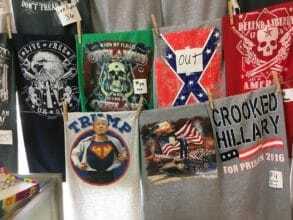 As expected, almost all the products carried the notorious flag… except for the many T-shirts emblazoned with Donald Trump’s face. Some people argue that the Confederate flag is the unofficial logo for racists, while others believe it’s simply cultural heritage. That’s what the lady behind the cash register said to me. I only read later that the woman who owns the store is the daughter of KKK leader Thomas Robb, who lived half an hour away, just across the Arkansas border. He’s famous for paying to have billboards posted here with texts like: ‘Diversity is code for #whitegenocide’. That evening, I checked out the Branson Belle showboat, moored by the shores of an artificial lake, beside a replica of a wooden plantation manor. Standing by the water, I got to chatting with a slightly older couple, retirees from southern California, who had ended up here in Missouri. Mainly because you didn’t have to be ashamed of your faith here, they told me. And this place had ‘wholesome entertainment’, like Christian country music, and dinner shows that didn’t involving any cursing. I definitely had to see one of those shows, they said. Instead, I decided to spontaneously drop by the ranch owned by Robb, the KKK leader whose daughter owned that store. Just across the border in Arkansas, his ‘Christian revival center’ offered a place for people to be racist under the guise of studying the Bible. The ranch was tucked away in the rolling hills; I drove over sandy, unpaved roads and felt stones pinging off the chassis of my car. Unfortunately, the ranch was closed and Robb wasn’t home. I drove back to Branson, making a pit stop in the small town of Blue Eye, home to the television studio of Jim Bakker, a TV minister who had been convicted of fraud. He was now running an apocalypse-oriented TV show advertising his survival foods. Jim Bakker wasn’t home either, although the store was open, selling buckets of survival foods at cut-rate prices. 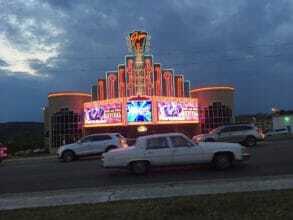 Kitsch, commerce, religion, racism: it all blended together in this region as if it had always been meant to be that way, as if Branson and the surrounding area had a special magnetic field that attracted all these forces. This was not the real face of America, but it was the ‘pure’ America that some people envision, people like Donald Trump. And this America is a success: Branson brought in nine million visitors last year, a record for the town. In fact, I read in the Washington Post that Branson is attracting so many visitors that they’re bringing in workers from Puerto Rico to do the jobs that the locals don’t feel like doing. That might explain why I saw such a rainbow of different ethnicities in this white Valhalla. This is part 4 of our blog series ‘Poverty and profit in the American city’. Upcoming: an interview by Katherine Oktober Matthews with speaker Matthew Desmond, a review by Lize Geurts of the exhibition based on Desmond’s book ‘Evicted’ in the National Building Museum in Washington DC, and a column by UvA-postdoc researcher Cody Hochstenbach who will join the conversation with Desmond at our event at De Balie on July 4th.